Hide deals from seller "Mariscos El Amigo"
Hide deals from category "Mexican"
Limit 1 per person and 1 per table. Valid toward all menu items excluding drinks. Dine-in only. New customers only. Full value of Gift Certificate must be redeemed in 1 visit. 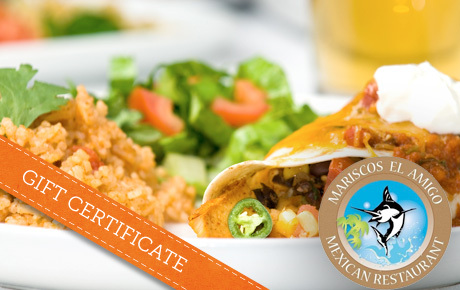 Spice up your next meal with 50% off a $30 Gift Certificate to Mariscos El Amigo in Hanover Park. This friendly and vibrant restaurant offers authentic Mexican cuisine and specializes in succulent seafood dishes. In business for 17 years, Mariscos El Amigo is a longstanding restaurant dedicated to providing excellent customer service and the finest Mexican cuisine. The bright, airy atmosphere makes for a fun and comfortable dining experience. Try a classic item like the fajitas a la Mexicana, which come with grilled steak or chicken as well as onions, tomatoes and jalepeños. If you're feeling more adventurous, try the raw oysters or an octopus cocktail. There's something for everyone at Mariscos El Amigo. A Mexican restaurant in Hanover Park specializing in seafood dishes.